It’s okay that we have a massive dragnet because the men running it are very honorable and diligent. The men running the dragnet refuse to answer a series of straight questions, and when they do, they’re either wrong or deeply dishonest. I’ll lay that out in more detail later. 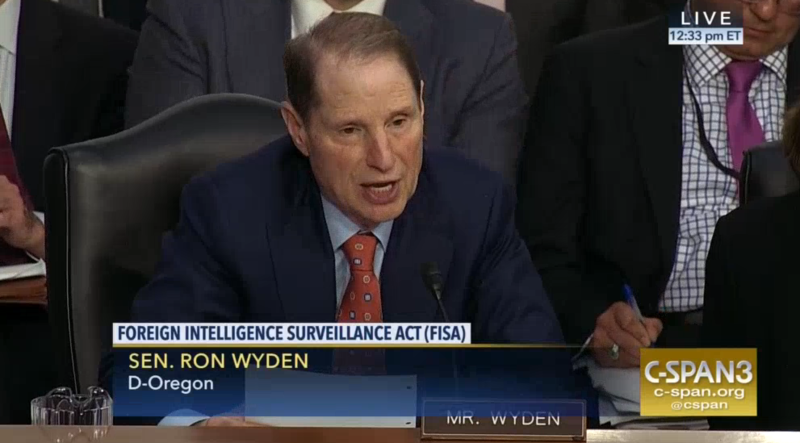 Wyden: Can the government use FISA 702 to collect communications it knows are entirely domestic? Coats: Not to my knowledge. It would be against the law. Coats’ knowledge should necessarily extend at least as far as Rosemary Collyer’s opinion reauthorizing the dragnet that Coats oversees, which was, after all, the topic of the hearing. 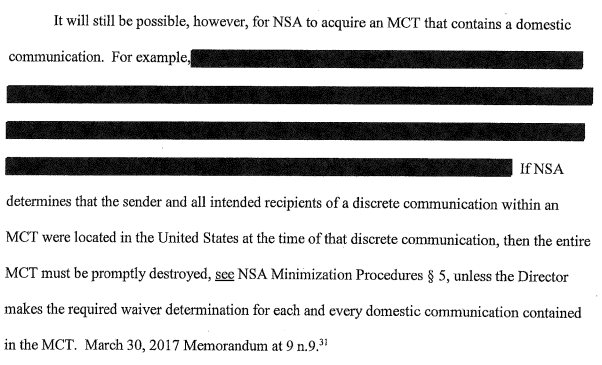 And that opinion makes it quite clear that even under the new more limited regime, the NSA can collect entirely domestic communications. Indeed, the passage makes clear that that example was presented in the memo tied to the certification about Section 702 that Coats signed (but did not release publicly). Effectively, Dan Coats signed a certificate on March 30 stating that this collection was alright. I’m not sure what this example refers to. Collyer claims it has to do with MCTs, though like Dan Coats, she didn’t seem to understand the program she approved. There are multiple ways I know of where entirely domestic communications may be collected under 702, which I’ll write about in the near future. In any case, if Dan Coats was being truthful in response to Wyden’s question, then he, at the same time, admitted that he certified a program without even reading the accompanying memorandum, and certainly without understanding the privacy problems with the program as constituted. He either lied to Wyden. Or admitted that the current 702 certification was signed by someone who didn’t understand what he was attesting to. Update: I did a version of this (including comment on Mike Rogers’ testimony) for Motherboard. It includes this explanation for Coats’ comment. Section 702(b)(4) plainly states we ‘may not intentionally acquire any communication as to which the sender and all intended recipients are known at the time of acquisition to be located in the United States.’ The DNI interpreted Senator Wyden’s question to ask about this provision and answered accordingly. Ouch. Another least untruthful answer is my bet. And Senator Wyden knows it. Coats was probably thinking “no, no 702 anymore, it’s all under 12333 now, but that was not the question” (nor point of hearing). Zack Whittaker covers todays hearing and refs Marcy on 702 violations that she documented. Director of national intelligence Dan Coats, NSA director Mike Rogers, acting FBI director Andrew McCabe, and deputy attorney general Rod Rosenstein testified at a Senate Intelligence Committee hearing on Wednesday, unified behind a legislative effort to ensure the government maintains its sunsetting foreign surveillance and data collection capabilities. Coats, in his opening remarks, confirmed that the Trump administration is pushing for a “permanent reauthorization” of Section 702, which would prevent it from expiring. Reversing his pledge, Coats said during Wednesday’s hearing that the government will not release a number, citing a lack of resources and the risk of violating the privacy of those whose identities are verified. Coats claimed that that were “no instances of intentional violations of Section 702” since the 2008 amended law introduced the statute. Muckrock does not waste any time. The existence of these declassified memos was disclosed by Comey in his Statement for the Record Senate Select Committee on Intelligence. #UnfitForOffice is poison, and those that have to deal with him want to keep their distance. Comey without Sessions present, Sessions offering to resign, and Spicer buying a vowel finally. The rift stems from Sessions’s decision in March to recuse himself from the probe of possible ties between Trump’s 2016 campaign and Russia, a decision Trump was unaware of until minutes before it occurred. White House press secretary Sean Spicer earlier Tuesday refused to say if Trump has full confidence in Sessions. Reality Winner was setup? Fits. Also reports not consistent on arrest date. Some say 2017-06-05 (publish date), some say 2017-06-03. It was Saturday, 2017-06-03 when she was arrested. On June 5 The Intercept published a story about a top-secret NSA document that was provided to us completely anonymously. And with some 500,000 contractors out there with security clearance maybe a “probabalistic setup” was in play. Some civic-minded person would be unable to resist the bait. And the NSA would be waiting. More than that. Winner may have done absolutely nothing. Pure frame job. This is NSA remember? Her password is useless inside an NSA environment. 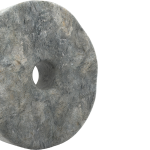 They have access to the machines with the hashed/salted/encrypted password. They can crack it in minutes. So, at 6:20am EST, was she normally at work then? Was the IDed printer her default printer? Someone else, after cracking her login, could have done the entire ‘leak’ just to frame her. As I said, I think she is smarter than this, and she definitely knows better opsec. Anyone working for NSA, either directly or via a subcontracting job thru a spycorp, can definitely be framed in this manner.